Chambers Auto Glass is the #1 mobile back/rear auto glass repair and replacement company in Baldwin County, AL. 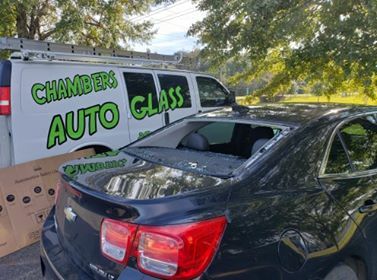 What makes Chambers Auto Glass the best back auto glass repair and replacement company in Baldwin County, AL? Unlike a windshield, if your vehicle’s rear window ( back glass, rear glass ) is damaged it most likely will need to a replacement. The certified technicians at Chambers Auto Glass only uses the best glass rear replacement products available on the market. So you can be rest assured that the quality of the product that you receive will last for a long time. Chambers Auto Glass takes pride and has always been driven in providing the best customer support and service during your repair. and can even help you with your insurance claim ( we can file your insurance claim too! ) and take so much of the struggle out of the process for you as well. Your rear windshield (also rear glass, back glass, rear window) is manufactured using a different process than your traditional front windshield. Unlike your front windshield that comes laminated, most side and rear glass is tempered glass and when struck with enough force and magnitude will shatter into thousands of tiny little pieces that can make a huge mess. We are sure that a large opening in your vehicle is a huge safety concern that needs immediate attention. If you have any damage to your rear auto glass, call Chambers Auto Glass right away and we will send one of our certified Auto Glass Safety Council technicians to your home or office to help you the same day ( no drive fee! ). Let Chambers Auto Glass help restore your vehicle back to normal. Call to get your free quote today and you will see the Chambers Auto Glass difference! We use the finest auto glass available to the market. Best part? We have the lowest prices guaranteed, and we drive to you free. Helping Customers in Baldwin County with Auto Glass repair and replacement for over 32 years. Chambers Auto Glass has been a very reputable family owned for over 13 years. When I was 19 I learned from big auto glass companies how to replace automotive glass. They taught me how to do it right, the old fashion way. Taking our time to make sure the job is done with the highest-quality care. As time passed I saw how big auto glass companies would constantly rush installers to install as many windshields as possible every single day. This is when the repairs and replacements go wrong, leaks, scratched glass, scratched paint, and wet electronics. This is when I decided to open Chambers Auto Glass, so I can give a high quality installation the first time.